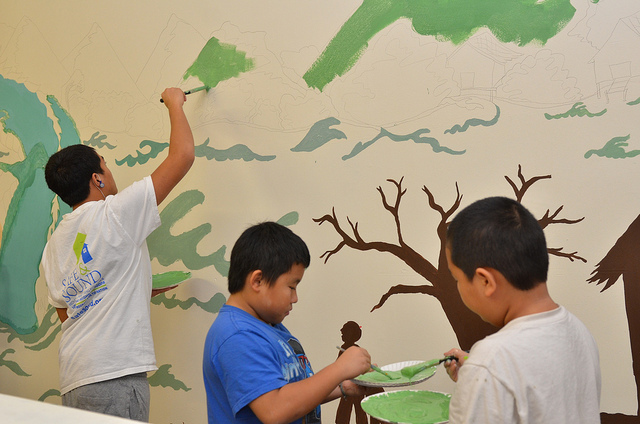 A legendary serpent said to live in Southeast Asia’s Mekong River seems to writhe across one wall in the Hmong American Friendship Association as a group of young people fill in the pencil sketch with brilliant shades of green paint. Aaron Moua, a seventh-grader at Audubon Middle School, isn’t sure whether the mythical creature symbolizes good or evil but guesses that whatever else, it represents power. On a recent Saturday morning, about a dozen Hmong youth from HAFA and an equal number of African American youth from Neighborhood House of Milwaukee worked together to decorate HAFA’s community hall with murals depicting Hmong history and folklore. “The purpose of the exercise is to initiate conversation about cultural differences and create cultural competence,” said Safe & Sound community organizer Phoua Vang. “These youth share the same neighborhoods and the same resources but they have misunderstandings about each other,” Vang said. By working together to understand their own and each other’s cultures, Vang hopes to break down negative stereotypes and build tolerance and understanding among the youth. She wants them to see that “as individuals, they can have a huge impact on the neighborhood by keeping open minds about the different cultures that they share the neighborhood with,” Vang said. Projects like this also give the young people, who live in a high-poverty area, something to do to keep them safe, off the streets and involved in positive social and learning activities, Vang added. Vang designed the mural project to continue the conversation the youth began while working on a “PhotoVoice” project last summer. In that project, the youth assessed and photographed some of their neighborhoods’ assets and liabilities. Then, they walked Mayor Tom Barrett through one neighborhood to show him what they had identified as valuable and what they thought needed to be changed to improve safety. HAFA, 3824 W. Vliet St., and Neighborhood House, 2819 Richardson Place, are designated by Safe & Sound as “Safe Places.” The Safe Places program aims to minimize youth involvement in gang and other criminal activity. 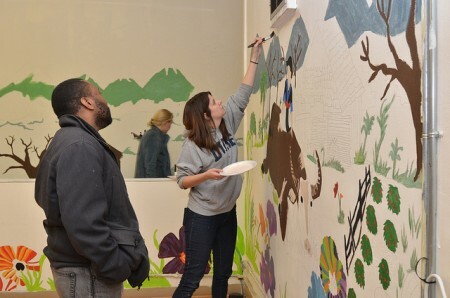 Two other organizations contributed to the mural project. Milwaukee Habitat for Humanity donated the paint and representatives taught the young people how to restore furniture. Washington Park Partners provided lunch.